For other uses, see Minutemen (disambiguation). Minutemen were civilian colonists who independently organized to form well-prepared militia companies self-trained in weaponry, tactics, and military strategies from the American colonial partisan militia during the American Revolutionary War. They were also known for being ready at a minute's notice, hence the name. They provided a highly mobile, rapidly deployed force that allowed the colonies to respond immediately to war threats. The minutemen were among the first to fight in the American Revolution. Their teams constituted about a quarter of the entire militia. They were generally younger and more mobile and served as part of a network for early response. The term has also been applied to various later United States civilian-based paramilitary forces to recall the success and patriotism of the originals. In the British colony of Massachusetts Bay, all able-bodied men between the ages of 16 and 60 were required to participate in their local militia. As early as 1645 in the Massachusetts Bay Colony, some men were selected from the general ranks of town-based "training bands" to be ready for rapid deployment. Men so selected were designated as minutemen. They were usually drawn from settlers of each town, and so it was very common for them to be fighting alongside relatives and friends. 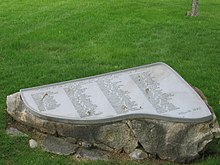 Some towns in Massachusetts had a long history of designating a portion of their militia as minutemen, with "minute companies" constituting special units within the militia system whose members underwent additional training and held themselves ready to turn out rapidly for emergencies, "at a minute's notice" and hence their name. Other towns, such as Lexington, preferred to keep their entire militia in a single unit. Members of the minutemen, by contrast, were no more than 30 years old, and were chosen for their enthusiasm, political reliability, and strength. They were the first armed militia to arrive at or await a battle. Officers were elected by popular vote, as in the rest of the militia, and each unit drafted a formal written covenant to be signed upon enlistment. The militia typically assembled as an entire unit in each town two to four times a year for training during peacetime but, as the inevitability of war became apparent, the militia trained three to four times a week. In this organization, it was common for officers to make decisions through consultation and consensus with their men, as opposed to giving orders to be followed without question. The Massachusetts Provincial Congress recommended to the militia to form themselves into companies of minute-men, who should be equipped and prepared to march at the shortest notice. These minute-men were to comprise one-quarter of the whole militia, to be enlisted under the direction of the field-officers, and divide into companies, consisting of at least 50 men each. The privates were to choose their captains and subalterns, and these officers were to form the companies into battalions, and chose the field-officers to command the same. Hence the minute-men became a body distinct from the rest of the militia, and, by being more devoted to military exercises, they acquired skill in the use of arms. More attention than formerly was likewise bestowed on the training and drilling of militia. The need for efficient minuteman companies was illustrated by the Powder Alarm of 1774. Militia companies were called out to resist British troops, who were sent to capture ammunition stores. By the time the militia was ready, the British regulars had already captured the arms at Cambridge and Charlestown and had returned to Boston. In August 1636, the first offensive military attack by militias failed when Massachusetts dispatched John Endecott with four companies on an unsuccessful campaign against the Pequot Indians. According to one man's account, the expedition succeeded only in killing one Indian and burning some wigwams. Weeks elapsed between the incidents that caused the march and the arrival of Endecott's men in the area. Once they got there, they did not know which Indians to fight or why. This feeble response served to encourage the Indians, and attacks increased on the settlers in the Connecticut Valley. In the following year, Massachusetts again put a force on the field in collaboration with Plymouth and Connecticut. By the time that Plymouth had gotten their force packed and ready to march, the campaign had ended. 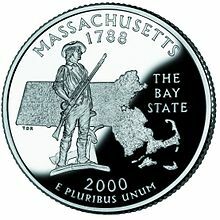 Massachusetts Bay sent 150 militiamen, Plymouth sent 50, and Connecticut sent 90. In May 1643, a joint council was formed. They published the articles of the New England confederation. The real power of the confederation was that all four of the colonies promised to contribute soldiers to an alert force that would fight anywhere in the colonies. On September 7, 1643 the towns were given more tactical control. A new rule allowed any general to call up his militia at any time. On August 12, 1645, 30% of all militia were made into short-notice groups (minutemen). Command and control were decentralized to the extent that individual company commanders could put their troops into a defensive battle if necessary. A portion of the militia was well trained and well equipped, and set aside as a ready force. In May 1653, the Council of Massachusetts said that an eighth of the militia should be ready to march within one day to anywhere in the colony. Eighty militiamen marched on the Narragansett tribe in Massachusetts, though no fighting took place. Since the colonies were expanding, the Narragansetts got desperate and began raiding the colonists again. The militia chased the Indians, caught their chief, and got him to sign an agreement to end fighting. In 1672, the Massachusetts Council formed a military committee to control the militia in each town. In 1675, the military committee raised an expedition to fight the raiding Wampanoag tribe. A muster call was sent out and four days later, after harsh skirmishes with the Wampanoags, three companies arrived to help the locals. The expedition took heavy losses: two towns were raided, and one 80-man company was killed entirely, including their commander. That winter, a thousand militiamen pushed out the Wampanoags. In response to the success of the Wampanoags, in the Spring of 1676 an alarm system of riders and signals was formed in which each town was required to participate. The British and French, each with Indian allies, engaged in various fights beginning in 1689 and dragging on for almost a hundred years. In 1690, Colonel William Phips led 600 men to push back the French. Two years later he became governor of Massachusetts. When the French and Indians raided Massachusetts in 1702, Governor Phips created a bounty which paid 10 shillings each for the scalps of Indians. In 1703, snowshoes were issued to militiamen and bounty hunters to make winter raids on the Indians more effective. The minuteman concept was advanced by the snow shoe men. The Minutemen always kept in touch with the political situation in Boston and their own towns. From 1629 to 1683, the towns had controlled themselves but in 1689, the King appointed governors. By 1772, James Otis and Samuel Adams used the Town Meetings to start a Committee of Correspondence. This instigated a boycott in 1774 of British goods. The Minutemen were aware of this as well. With a rising number of Minutemen they faced another problem: a lack of gunpowder to support an army for long enough to fight a prolonged campaign against the British. The people of an island controlled by the Dutch, Sint Eustatius, were supportive of the idea of a large rebellion rising up against the British in the New World. As a token of support, they traded gunpowder to the Colonials for other goods needed in Europe. Not only did the Minutemen have political awareness of events in New England, but also of anti-British feeling in other countries, such as Holland and France. In 1774, General Thomas Gage, the new Governor of Massachusetts, tried to enforce the Intolerable Acts, which were designed to remove power from the towns. Samuel Adams pressed for County Conventions to strengthen the revolutionary resistance. Gage tried to seat his own court in Worcester, but the townspeople blocked the court from sitting. Two thousand militiamen marched to intimidate the judges and get them to leave. This was the first time that the militia was used by the people to block the king's representatives from acting on royal orders and against popular opinion. Gage responded by preparing to march to collect munitions from the provincials. For 50 miles around Boston, militiamen were marching in response. By noon the next day, almost 4,000 people were on the common in Cambridge. The provincials got the judges to resign and leave. Gage backed off from trying to seat a court in Worcester. The colonials in Worcester met and came up with a new militia mobilization plan in their County Convention. The Convention required that all militia officers resign. Officers were then elected by their regiments. In turn, the officers then appointed 1/3 of their militia regiment as Minutemen. Other counties followed Worcester's lead, electing new militia officers and appointing Minutemen. The British practiced formations with their weapons, focusing on marching formations on the battlefield. It is a myth that the British and other professional armies of the 1700s did not practice marksmanship with their muskets; the military ammunition of the time was made for fast reloading and more than a dozen consecutive shots without cleaning. Accuracy of the musket was sacrificed for speed and repetitive loading. The royal authorities in Boston had seen these increasing numbers of militia appearing and thought that the militia would not interfere if they sent a sizable force to Concord to seize munitions and stores there (which they considered the King's property, since it was paid for to defend the colonies from the American Indian threat). The British officers were proven wrong. Shooting erupted at Lexington (there is still a debate as to whether it was a colonist or a British soldier who fired the infamous "shot heard 'round the world"). The militia left the area, and the British moved on. The British then moved to Concord and faced a larger number of militia. The British were rapidly outnumbered at Concord, with the arrival of the slower moving militia; they had not counted on a long fight, and so had not brought additional ammunition beyond the standard issue in the soldiers' cartridge boxes. This then forced a strategic defeat on Colonel Smith, forcing him back to Boston. A "running fight" began during the retreat. Militiamen knew the local countryside and were familiar with "skulking" or "Indian Warfare." They used trees and other obstacles to cover themselves from British gunfire and pursuit by British soldiers, while the militia were firing and moving. This kept the British under sporadic fire, and caused them to exhaust their limited ammunition. Only the timely arrival of a relief column under Lord Percy prevented the annihilation or surrender of the original road column. Most Colonial militia units were provided neither arms nor uniforms and were required to equip themselves. Many simply wore their own farmers' or workmans' clothes and, in some cases, they wore cloth hunting frocks. Most used fowling pieces, though rifles were sometimes used where available. Neither fowling pieces nor rifles had bayonets. Some colonies purchased muskets, cartridge boxes, and bayonets from England, and maintained armories within the colony. The Continental Army regulars received European-style military training later in the American Revolutionary War, but the militias did not get much of this. They were better when used as irregulars rather than fighting formal battles in the traditional dense lines and columns, functioning primarily as skirmishers and sharpshooters. When used in conjunction with continental regulars, the militia would frequently fire ragged irregular volleys from a forward skirmish line or from the flanks of the Continental Army, while Continental soldiers held the center. Their experience suited irregular warfare. Many were familiar with frontier hunting. The Indian Wars, and especially the recent French and Indian War, had taught the colonials the value of irregular warfare, while many English troops fresh from Europe were less familiar with this. The long rifle was also well suited to this role. The rifling (grooves inside the barrel) gave it a much greater range than the smoothbore musket, although it took much longer to load. Because of the lower rate of fire, rifles were not used by regular infantry, but were preferred for hunting. When performing as skirmishers, the militia could fire and fall back behind cover or behind other troops, before the British could get into range. The wilderness terrain that lay just beyond many colonial towns favored this style of combat and was very familiar to the local minuteman. In time, however, loyalists such as John Butler and Robert Rogers mustered equally capable irregular forces (Butler's Rangers and the Queen's Rangers, led by Englishman John Graves Simcoe). In addition, many British commanders learned from experience and effectively modified their light infantry tactics and battle dress to suit conditions in North America. Through the remainder of the Revolution, militias moved to adopting the minuteman model for rapid mobilization. With this rapid mustering of forces, the militia proved its value by augmenting the Continental Army on a temporary basis, occasionally leading to instances of numerical superiority. This was seen at the Battles of Hubbardton and Bennington in the north and at Camden and Cowpens in the south. Cowpens is notable in that Daniel Morgan used the militia's strengths and weaknesses skillfully to attain the double-envelopment of Tarleton's forces. There was a shortage of ammunition and supplies, and what they had were constantly being seized by British patrols. As a precaution, these items were often hidden or left behind by minutemen in fields or wooded areas. Other popular concealment methods were to hide items underneath floorboards in houses and barns. The Minuteman model for militia mobilization married with a very professional, small standing army was the primary model for the United States' land forces up until 1916 with the establishment of the National Guard. 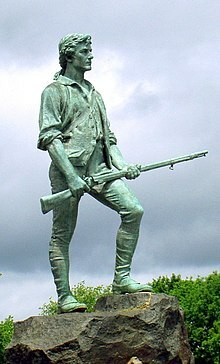 In commemoration of the centenary of the first successful armed resistance to British forces, Daniel Chester French, in his first major commission, produced one of his best-known statues (along with the Lincoln Memorial), the Concord Minute Man of 1775. Inscribed on the pedestal is the opening stanza of Ralph Waldo Emerson's 1837 Concord Hymn with the immortal words, "Shot heard 'round the world." The statue's likeness is not based on Isaac Davis as is widely claimed, the captain of the Acton militia and first to be killed in Concord during the Battles of Lexington and Concord on April 19, 1775, but rather French used live models in the study of the anatomy and facial expression. The Minute Man statue is still the symbol of the National Guard, featured prominently on its seals. Minutemen are portrayed in "Paul Revere's Ride", a poem by Henry Wadsworth Longfellow. Although historians criticize the work as being historically inaccurate, Longfellow understood the history and manipulated it for poetic effect. The athletic teams of the University of Massachusetts-Amherst are nicknamed the Minutemen and Minutewomen. Until the 2003 rebranding featuring a modernized Sam the Minuteman, the logo featured the Concord Minute Man statue prominently. The US Air Force named the LGM-30 Intercontinental Ballistic Missile the "Minuteman", which was designed for rapid deployment in the event of a nuclear attack. The "Minuteman III" LGM-30G remains in service. One of the factions in Bethesda's 2015 video game Fallout 4, which is set in Massachusetts, is called the "Commonwealth Minutemen". The inspiration for their namesake comes from the requirement to be ready "at a minute's notice" to defend any settlement in danger. Negatively, Sinclair Lewis portrays Minute Men as paramilitary forces of Buzz Windrip despotic government in It Can't Happen Here. In his book, the fascist-like militia is called "Minnie Mouses" by the populace. Chisholm, Hugh, ed. (1911). "Minute Men" . Encyclopædia Britannica. 18 (11th ed.). Cambridge University Press. p. 656. ^ a b Sparks, Jared: The Life of George Washington, page 134-135. F. Andrews, 1853. ^ William K. Emerson (2004). Marksmanship in the U.S. Army: A History of Medals, Shooting Programs, and Training. University of Oklahoma Press. p. 5. ISBN 978-0-8061-3575-5. ^ "Minutemen - Minuteman Security Systems". Retrieved 2016-07-03. ^ "Daniel Chester French, 1850-1931 The Minute Man; essay by Thayer Tolles". www.tfaoi.com. Retrieved 2016-07-03.